His Twitter profile says: "I'm the biggest straw goat in the world, follow my struggle to survive arson attacks". 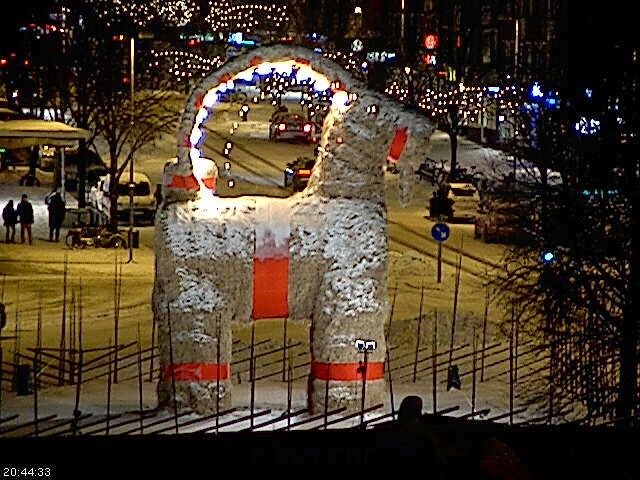 Well, I thought I'd pass on the good news that our big Swedish straw friend has made it to Christmas Day. 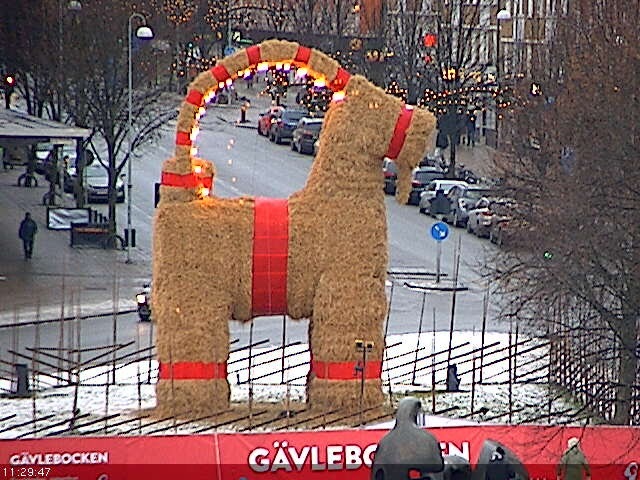 This screenshot was taken from the live webcam from 20 minutes ago - and he's still standing, yeah yeah yeah! Last night saw TV presenter Caroline Flack and her professional partner Pasha Kovalev lift the glitterball trophy. The couple are this year's winners of "Strictly Come Dancing" which is now Britain's top entertainment show, as it hammered "The X Factor" in the 2014 Saturday night ratings battle. All good news then for the show which began early in 2004 (believe it or not there were 2 series that year!) as a revival of the old TV dance competition, Come Dancing, only this time with celebrities competing, dancing with professional partners. The role and importance of the judging panel has been promoted over recent years and reached its peak (or new low, whatever the case) during this series with them dancing on during their introduction. It's tacky and embarrassing. Another problem is that the three male judges have long ceased to offer anything new or constructive - there's Craig Revel Horwood's panto-baddie persona, with the glum face, and "that was a disaaaaastah daaaarling"; head judge (and star of the teatime Farmfoods TV ads) with his '10 from Len' and 'pickled me walnuts' Len Goodman; standing-up arm-waving Bruno "you were like a....." Tonioli are all well past their sell-by dates and are as much a parody of themselves as Louis Walsh is on X Factor. As the years have passed there is less focus on the technical elements of dance, replaced by pandering to celebrity egos. And then there is the issue of the female judge: Arlene Phillips did a perfectly good job in her critique in the early years before controversially being axed in favour of a younger model, previous winner Alesha Dixon who was a poor substitute. Alesha subsequently defected to ITV and was replaced by ballet dancer Darcey Bussell who in my opinion hasn't brought anything to the show - Arlene Phillips still remains the best female judge IMHO. As for the presenters, the 2014 series was the first co-presented by Tess Daly and Claudia Winkleman, the latter replacing Bruce Forsyth. Whilst they were professional enough, I still don't understand the love for Claudia Winkleman and preferred Zoe Ball who covered during a couple of weeks of Claudia's emergency absence this series. The actual 'dancing' element has become secondary on an entertainment show. In the early days, everyone did the same dances every week. Now it's a mish-mash of prop-aided numbers, even with - shock horror! - backing dancers thrown in on occasions, and it's often hard to tell what kind of dance it's supposed to be. And please don't start me on the music.....apart from Dave Arch and his 'fabulous singers', will the producers please, please take note that contemporary hit songs are not always the perfect match for a particular dance. The professionals have changed over the years: only Anton du Beke and Brendan Cole remain from the original series (and Brendan's grumpy expressions this year suggest a man who would rather be somewhere else); I particularly miss Darren Bennett and Lilia Kopylova, Vincent Simone and Flavia Cacace. It was a great pleasure to see Vincent and Flavia's Midnight Tango show live in Glasgow a couple of years ago and they are taking their latest dance extravaganza on tour next year. The 'newer' professionals just don't have the same appeal for me. My biggest gripe with Strictly is the inclusion of celebrities who are already trained dancers or have that experience in their field of work - for example, pop stars and girl band/boy band members will always have an advantage over other contestants with two left feet or very little or no dance experience. This probably explains why the 'perfect' dancers (Pixie Lott, Frankie Bridge, Rachel Stevens, Denise Van Outen, Natalie Gumede etc etc) never win the contest - you can only fool some of the public some of the time.....over the years the public has chosen contestants (mostly male) whose progress has been evident over the course of a series, and viewers have invested in that old reality cliché, the "journey" e.g. Darren Gough, Chris Hollins, Harry Judd, Tom Chambers. I don't know anything about Caroline Flack apart from her being a TV presenter who previously dated Harry Styles, so just judged her on her dancing alone. I thought she was impressive from the beginning, but she was just too good and I suspected that she may not be a total beginner. But I put my suspicions aside and hoped that she was just picking up the steps quickly. So today I am deeply disappointed to read that Ms Flack is in fact a trained dancer. Even if it was 16 years ago, she still has that advantage. Strictly would go up in my estimations if all the contestants started from a level playing field, and would be much more gripping and entertaining viewing as a result. So that's it for Strictly Come Dancing for another year, and there are still so many unanswered questions. Such as, who came 2nd? Who came 3rd? Why does the BBC not publish the week-by-week voting percentages? And the biggest question of all: what celeb-reality competition is Mark Wright going to turn up on next? Once upon a time, the annual NRJ Music Awards used to take place every January in conjunction with the MIDEM festival in Cannes. But these days the awards take place in mid-December so let's check out the results of this year's competition which took place last night at the Palais des Festivals. The show was presented by Nikos Aliagas, who previously presented Star Academy (those were the days!) and he now presents the French version of The Voice. The big winner on the night was Kendji Girac. Since winning the 3rd series of the French version of "The Voice", he has become a big star. (Unlike winners of The Voice UK, who seem to immediately sink without trace!) Yet again this year I've been out of the loop with French music, so I had a listen to some clips of his album on iTunes. He cleverly blends Flamenco and Latin influences with a more contemporary and commercial style with very pleasant results. It's a refreshing change from all the stale dance music and acoustic bores polluting the charts these days, so I'm very happy to see him doing so well. It was a record-breaking 11th NRJ Music Award for Matt Pokora, who has now won more of these awards than any other artist, overtaking Mylène Farmer who previously won the most NRJ awards. While we're on the subject of Mylène, in recent years we've come to expect either a new album or DVD release around this time of the year, but there's nothing, zilch, nada this year. Although as with all things Mylène, in the absence of news, the rumour machine will fire up. It is rumoured that Mylène will not be working with Laurent Boutonnat on her next album but is allegedly collaborating with Matt Bellamy of Muse. An intriguing collaboration, but whether it will come true, and indeed how the fandom will react, well we will just have to wait and see. The storm after the calm. It's been a terrible, rain-soaked summer on the Dalmatian coast, which lasted up to the week before our holiday. We have been lucky enough to get through the week with the most perfect weather, but as forecast, the rain finally came this morning. It started with showers just after 7.00am, and by 9.30am it had turned into a torrential storm. I'm having a Vukasin Brajic moment here. Thunder and lightning holding hands. What is particularly astonishing is that there is a football match going on amid all this horrible weather. The local footie team is obviously made of much stronger stuff than your average Premiership prima donnas. The rain continues until just after 12.00 noon, by which time we're on Trogir seafront which is slowly recovering from the onslaught of this morning's storm. After the rain storm passes, the mist is hanging low over the mountains. After our final lunch in Trogir (sob!) there's more souvenir shopping to be done in the maze-like streets of the town. There is some really nice jewellery to be had - some of it very expensive indeed - but there are some bargains if you look for them. Couple of bracelets bought today = job done. Back today to Delicium Nostrum, a lovely little shop selling local specialities. Earlier in the week I'd spotted a nice toiletries set which included one of those natural sponges which you always see on holiday in Greece and Turkey, so I made a point of returning to this shop to purchase the set today. Talking of those sponges, they pop up regularly in shop doorways in Trogir and always remind me of giant garlic bulbs wrapped in netting! Today I also buy a nice purple patterned bag which is a must-have as purple is of course my favourite colour. After all that shopping it's time for a thirst-quenching Orangina at a pavement café. ....accompanied of course by another Croatian wine, this time it's a Plavac. Note the bizarre percentage (13.7%) which seems to be common to a number of Croatian wines we've tried over the week. Over the course of our week in Trogir we've been admiring some very nice yachts moored on the Riva. Here's one I spotted on our last night. Trogir is a very "nautical" town and you are always reminded of this, whether it's all the seafaring clothing and souvenirs in the shops, or the numerous vessels big and small which travel up and down this part of the beautiful Adriatic coast. Although I finally fulfilled that dream of going to Croatia, I still think that it would be terrific to go on a cruise down the Adriatic coast at some time in the future. I guess that's still one of my unfulfilled travelling ambitions. Apart from that though, I could see us returning to Trogir in the future. It's a magical little place which stole my heart, and was the right place at the right time, finally bringing some peace into what has been a rather turbulent year for both of us. For now though, there's just time for one last drink at Caffe Trogir. It may be Saturday night, but the place is surprisingly quiet and there are no bands playing on the square tonight. We need to get back early tonight, as we have an early departure tomorrow. I won't bother posting about our onward travel arrangements and return to Glasgow, apart from saying that everything ran very smoothly indeed. The proximity of Split Airport to Trogir is a massive selling point for this holiday. Split Airport itself is compact and manageable, although it does have a "low-cost airline" feel to it, and I don't know how it would cope with high demand during the summer months. Almost three months on from our holiday, I miss Trogir more than I had expected to. I am reminded of the place every day when I switch on my computer at work and see a picture of the island, the coast and the surrounding mountain ranges. It is such a special little place and I really hope to return there some day. My friend is going there on holiday in 2015 and I hope she enjoys it as much as we did this year. Trogir is probably Croatia's best-kept secret, and it is waiting to be discovered. I'm so happy that we discovered it in 2014 for our wonderful summer holiday. Where to next? I genuinely haven't a clue about our spring and summer destinations for 2015, but Copenhagen and Trogir will be very hard acts to follow! We wake to the news of the referendum result: 55% voted no, 45% voted yes. So I'm in a somewhat gloomy mood on hearing the news. One of my first thoughts is "how am I going to explain this result to that lovely girl in the hotel who's been cheerleading for Scottish independence since we arrived here"? But she's not on today and that explanation will have to wait till tomorrow. In the meantime we have a holiday to be going on with, and after our journey to Split, we're Trogir-based today and I've got some serious shopping to do. ...and you want olive oil? In this market you can find more olive oil than anyone will ever need. And when you're finished, pick up a football top! What I particularly like about European towns and resorts is the way that supermarkets don't play such a massive role in people's daily lives the way that they do in this country. Trogir may be a very small town, but the market is packed full of enough goodies for your weekly shop. And if you don't fancy food shopping in the market then there's always the nearby Tommy and Konzum supermarkets. After our tour of the market on what's becoming a very hot day, it's time for lunch. We're back on the Riva at yet another of their never-ending row of restaurants. Following lunch, it's back through the gate and into the old town centre. Eventually we end up back at the main square where we usually while away most of our late evenings in Trogir. But today we're just in time for a klapa quartet doing a little mini-concert on the square. And I've decided that I'm ever so slightly in love with the guy who is second from left!! As I mentioned in a previous post, the square was one of the locations in the video for Klapa s Mora's "Mizerija" and today I sat on that wall. Which overlooks Caffe Trogir, our late-evening hangout. After a stop-off at our favourite little park beside the sea, it's back to the hotel to get ready for another evening meal. Friday night in Trogir is busy as expected and this time we're at a more traditional restaurant in town. Faithful travelling companion's trying out the pasticada whilst I'm just on the pasta. Tonight's dinner is accompanied by another bottle of local wine, this time a Dingac (red wine). Every restaurant we've been to so far has an extensive list of Croatian wines, so needless to say we've had to try a few of them in the interests of research over the past week. Just as on every other night this week, Friday night in Trogir is a good-natured fun-loving experience (only with added people as it's Friday night of course!). The weather is warm enough to spend morning until late evening out of doors, which is one of the best things about a holiday in September. This has been a brilliant holiday, at a much slower pace than we've been accustomed to over the years. Tomorrow's our last full day in Trogir, and it's going to be yet another relaxing one. 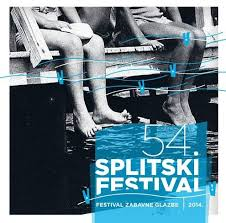 The Trogir Diaries: Day 5 - Thursday 18th September 2014: to split or not to split? A momentous day. It's the day of the Scottish independence referendum (for which we've both postal-voted in advance) and the big decision is to split or not to split from the UK. Rather appropriate then that today's agenda consists of a trip along the Dalmatian coastline to its biggest city - Split! Today is a DIY excursion and we're travelling on the Bura Line ferry which leaves at 11.15am. No pre-booking required, just turn up and go. However, as there's only a limited number of ferries every day, this one fills up very quickly so make sure you get there early. It's a leisurely boat trip between Trogir and Split, stopping off on the way at a little town called Slatine. You won't be surprised to learn that it's a most scenic arrival into Split - this part of the world is just one great big photo opportunity. There is also a cruise ship in town today, the Ocean Princess. If Trogir is a miniature maze, then Split takes it to a whole new level. It could probably take weeks to find your way round the place, and we're only here for a few hours, so we're not venturing too far away from the city's centre. Time for some souvenir shopping before heading back to the Riva for a quick afternoon coffee. The ferry for Trogir leaves at 4.00pm, when it's time to say goodbye to Split. Return boat trip done and dusted, it's back to the hotel via some of the town's less crowded streets, to get ready for another evening meal at one of the many restaurants on the Trogir Riva, before settling into what has become a nightly tradition on this holiday: late-night refreshments on the main square. Bravo Band are back again tonight and it's an entertaining end to the evening. We are now reaching that point of the holiday where a little bit of sadness is creeping in, with the realisation that we have only two more full days before going home. All the more reason to enjoy them to the full! The 10th series of Swedish Idol ended on Friday night with Lisa Ajax beating Mollie Lindén in the final. I tried and failed to watch the live stream, with added (and irritating/unnecessary) English language live commentary which if I remember correctly, was introduced last year. Lisa is the youngest ever Idol winner in Sweden and succeeds last year's winner, Swedish Premiership footballer Kevin Walker. For various reasons, give or take the odd clip I've completely missed this series of Idol, so I'm not qualified to comment on whether the 16 year old deserved to win or not: at the beginning of the contest I thought Matilda Gratte was a cert to win so didn't have a clue how it would all end following her shock departure. 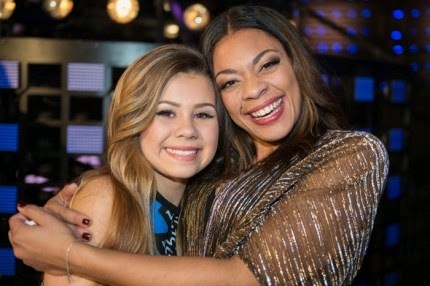 One very obvious thing about Idol in 2014 was that it was all about the girls: with few strong male contestants it was no surprise that it would be an all-female final between Lisa and Mollie, pictured above. Something has changed from previous years: the winner no longer gets a recording contract with the rush-released covers album: instead there will be a tour and the release of an EP including the winner's song "Unbelievable" which was co-written by former Fame Factory and Melodifestivalen contestant Jimmy Jansson. For me, there's nothing particularly spectacular (or indeed unbelievable-lievable-lievable!) about the mid-tempo ballad, however Lisa's voice certainly has a maturity beyond her years. I can't see a long career for her though: I'm guessing that she'll be pitched as a similar type of artist to the hugely popular Zara Larsson, but I can't really see Lisa emulating her success. Good luck to her though. There will be an 11th series next year: no doubt, as usual we can expect a lot of speculation from the Swedish tabloids about whether the judging line-up of Anders Bagge, Laila Bagge and Alexander Bard will return.